Discover the Jealously Guarded Discover the Jealously Guarded Discover the Jealously Guarded Discover the Jealously Guarded Discover the Jealously Guarded Discover the Jealously Guarded Discover the Jealously Guarded Insight s of Real Estate Tycoons and Hot Dealers! Back in the days of the wild, Wild West, when easterners traveled across this vast country looking for opportunity in the newly opened territories, they were often referred to as a ‘tenderfoot’. This wasn’t a complimentary term but it was a rather apt one. The easterners wore ‘city’ shoes that weren’t designed to withstand the rigors of the western terrain. Their hats didn’t have wide brims to protect them from the sun and their clothing wasn’t made of tough material like denim. These new westerners didn’t know how to take care of themselves and because they didn’t know where and what the dangers were they didn’t have any idea how to avoid them. If you are just beginning to consider the idea of investing in real estate you are a tenderfoot and you do need some instruction to avoid losing your shirt…and probably your pants, hat and boots, as well. 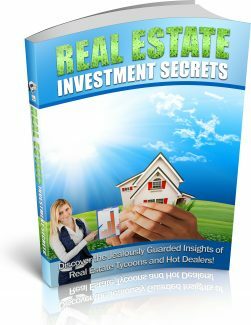 First you will need to determine what your strategy will be in real estate investing. Do you want to buy a property, fix it up and sell it quickly or do you want to buy a property, hold it and wait for the market to increase? Do you want to deal with renters? All of these questions are ones that you need to answer before you invest in any piece of real estate. You will need to learn how to investigate the value of properties yourself. It isn’t fair to use the time of a real estate agent and have them show you property after property while you try to look for a good real estate investment. There are several online sites that are helpful in determining the real value of real estate. DO NOT rely on tax values. They are not reliable and they are not accurate either. You can find a real estate agent that you can work with and you can find recommendations for such agents online. After you have learned how to determine property values yourself and have chosen a real estate agent that you can work with, the next thing that you need is a good broker that you can also work with. Ask your real estate agent for the names of three mortgage brokers. Then you will need to find out what interest rates and closing costs each one charges. (Check out your local bank or credit union as well). Take copies of your three credit reports and choose a sample property for each broker to run hard numbers on. Now you are ready to actually make your first investment. You want to choose the lowest price house in the best possible neighborhood to put a contract on. Let's say the cheapest two-bedroom house in the best neighborhood in Fort Wayne costs $100,000 and the next cheapest, comparable home is listed for $140,000. If you buy the home that is priced at $100,000, you can raise your price to $130,000 the next day and make a dandy little profit. Now let’s talk about closing the deal. First show the seller your pre-qualification letter from your lender. Then get the required inspections for termites and get your appraisal. Once you have all of your ‘ducks in a row’ so to speak, it takes about 30 days to make the final close. A note here about any renovations or repairs that you might want to make to the property: Before you close, you might want to think about a Purchase and Renovate loan. A Purchase and Renovate loan wraps the cost of construction up in the loan so you don’t have many out-of-pocket expenses. This may require an estimate from a general contractor and plans from an architect as well. Okay, now let’s go back to the first thing that you needed to do and that was to determine your strategy. Now is the time for you to execute that strategy that you have used to invest in this real estate. If you bought it with the strategy of flipping it when the market went up then you just simply wait. If you bought it with the strategy of renovating and then selling then it is time to start your renovations. On the other hand, if you bought it with the strategy of renting it, it is time to start looking for tenants. Why Invest in Urban Real Estate? Why Invest in Urban Real Estate?Why Invest in Urban Real Estate? Why Invest in Urban Real Estate? Why Invest in Urban Real Estate?Why Invest in Urban Real Estate? Why Invest in Urban Real Estate? Why Invest in Urban Real Estate? Why Invest in Urban Real Estate? Why Invest in Urban Real Estate? Why Invest in Urban Real Estate?Why Invest in Urban Real Estate? Why Invest in Urban Real Estate? Most investors are not interested in investing in urban real estate. This means that there is a wide open opportunity for those who ARE interested in investing in urban real estate. You will likely hear umpteen reasons why you should NOT invest in urban real estate so let me give you a few good reasons why you SHOULD invest in urban real estate. First let’s discuss the pricing of urban real estate. If you keep your ‘ear to the ground’ so to speak you can find some real hidden gems in the urban real estate market. Not every low price is a good deal, of course, and just like with every real estate investment that you ever make, you should be certain that you do your homework. Really great deals turn up in every real estate market for one reason or another. Don’t miss those terrific investment opportunities simply because the property is in an urban area. Then there are the Section 8 tenants to be considered. Here is an obvious advantage to investing in urban properties. Government subsidized housing is a 21st century reality and under Section 8 the government pays a full 80% of the monthly rent. These renters are often referred to as ‘Section 8 tenants’. There is, of course, always a waiting list of potential renters and they all want to move into YOUR urban investment property. That adds up to a very nice and sure monthly income for you. Renters don’t always pay their rent but the government does send checks on time and in full thus eliminating much of the rent collection hassle. Let’s not overlook the fix and flip opportunity afforded by urban real estate investments. Okay, let’s face it. Today’s real estate market could be better….a lot better…but just because the over-all market doesn’t seem to be all that healthy at the moment that doesn’t mean that there aren’t some great fix and flip opportunities out there and particularly in the urban areas. The trick to making a profit on an urban property is to sell with incentives included and, if it is a rental property, with a tenant already in residence.